Club Penguin Cheats by Mimo777 Club Penguin Cheats by Mimo777: Club Penguin Weekly Field Op Number 15 Cheats! Step 7. Go to the buoy by the Lighthouse. Your spy gadget light will turn green. Hey guys. Haven't seen me in awhile, have you? I've been really busy lately! What about you guys? My birthday is on the twenty eigth, and I was wondering if maybe we could have a party! Here's the info! Time: Around 7:00, eastern standard time. Place: My igloo! (Dianac99) It will be on map, we might move around, not sure yet. Did I forget anything? Who's gonna be there? Thanks! sweet thx, but i thought the field ops came out on tuesdays? Mimo! I just noticed something! When I looked at the homepage today, I saw a green penguin that was getting the "Ace Poliot" stamp. But something is added! There is a green puffle next to the penguin! New addition, I guess. Ok get this ppl! My membership expired today, so no clothes and no igloo, and a bunch of other stuff, BUT I still have all 12 of my puffles!!!! Is that a glitch or does that always happen? But ive neever seen a non member with a yellow puffle before! But im not complaining! I lovvve my puffles and im glad I still have em! I really hope cp lets me keep them forever!! 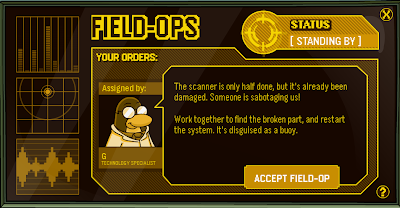 Has anyone noticed, this field ops is from the epf video? We might be building new scanners, possibly to censor when penguins (EPF) are close by, it opens up, and its like a new base, tactical, agent and, possibly anouther one coming? Plz pst, never eva been posted! Hmmm.... Not sure 'bout that, they always come out before normal updates, though.